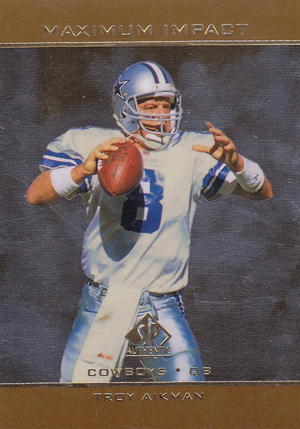 1998 SP Authentic Football is led by one of the top rookie cards from one of football's all-time great quarterbacks. The release comes with all the hallmarks that made SP Authentic one of the hobby's most popular brands, not just on the gridiron, but in all sports. 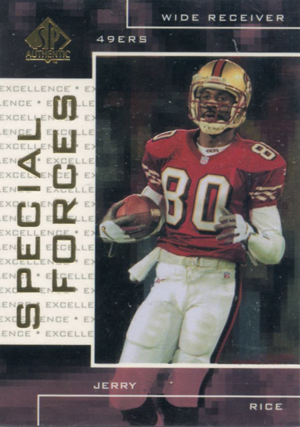 The 1998 SP Authentic Football checklist has 163 cards. The first 30 make up the Future Watch subset. Made up entirely of rookie cards, Future Watch cards are numbered to 2000. 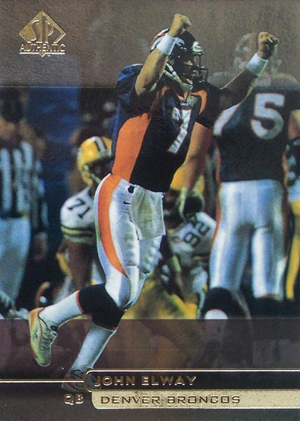 Peyton Manning is easily the top rookie card in the set. Others include Randy Moss, Charles Woodson, Fred Taylor and Ahman Green. Rookie Time Warp is the other subset in 1998 SP Authentic Football. Also numbered to 2000, these 12 cards look back on the rookie campaigns of the game's most popular veterans. The base set has a Die Cut parallel. All are numbered to 500. With autographs becoming more and more popular, Player's Ink signature cards fall one per pack. 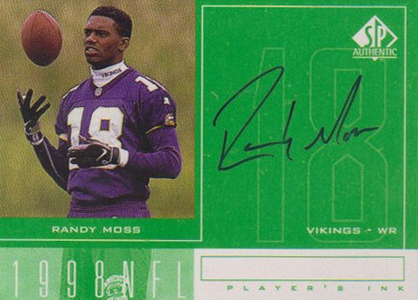 The list of 30 signers includes several rookies, such as Moss. Among the veteran autographs are Dan Marino, Troy Aikman and Jerry Rice. Player's Ink Silver cards are numbered to 100. Gold parallels are limited to the player's jersey number. Other inserts include Maximum Impact (30 cards, 1:4 packs), Maximum Impact Die Cuts, and Special Forces (30 cards, #/1000). 1998 SP Authentic Football boxes come with 24 packs of five cards. 126 cards. Future Watch cards (#1-30) numbered to 2000. Rookie Time Ward (#31-42) also numbered to 2000. 30 cards. Inserted 1:4 packs. 30 cards. Inserted 1:23 packs. Wadsworth available via redemption. 30 cards. Numbered to 1000.